Why Can’t Priests Get Married? Comments Off on Why Can’t Priests Get Married? A distinction must be made from the outset: some Catholic priests can get married and some can’t. This distinction is possible because there is nothing in the Deposit of the Faith that prohibits priests from being married. There is a long-standing practice, though, to require celibacy of Latin (or Roman) rite priests. In the Eastern rites, celibacy is generally not required — although it is required for bishops. Additionally, you will find married Catholic priests who come, for the most part, from one of the following scenarios: former Protestant ministers who have been ordained as priests under provisions approved by Pope St. John Paul II, former Anglican priests who have been received into the Catholic Church and been ordained Catholic priests after erection of Anglican Ordinariates by Pope Benedict XVI, or Orthodox priests who are received into the Catholic Church. The Latin Church does not see celibacy as an imposition. Rather, it sees celibacy as a sign that the priest’s consecration to the Lord is with an undivided heart, where “they give themselves entirely to God and to men.” “Celibacy is a sign of this new life to the service of which the Church’s minister is consecrated; accepted with a joyous heart celibacy radiantly proclaims the Reign of God” (Catechism of the Catholic Church, 1579). For any Catholic priest, if already ordained a priest, they cannot subsequently marry. Likewise, marriage after ordination is not possible ordinarily, without permission of the Holy See. This would apply in a situation if a wife died. Comments Off on Why Celibacy? What Is The Priest Wearing? Comments Off on What Is The Priest Wearing? In every day and age there have been certain cultural norms that are accepted and followed without much questioning. For instance, when eating out at a restaurant, you come to expect that the family eating at the next table over will be using a fork and a knife. In a another example, it is not acceptable to show up at a family wedding wearing a Hawaiian shirt and Bermuda shorts. The Catholic Church is no exception to these norms. It would be a strange start to Sunday Mass if the priest began processing down the aisle in a Halloween costume. As a Church we have come to assume and expect that our priest will begin Mass dressed in a certain manner. The question then becomes: Why does Father wear what he wears at each Mass? And what is the history behind his style of dress? Instead, the beginning of the holy vestments of the Christian Church came from the everyday garb of the Greco-Roman world. At the heart of this first-century dress was the tunic and the mantle. The Greeks believed that the tunic that draped from the shoulder was symbolic of the body and its movements. They believed that this enveloping cloak around the body with the head in the center expressed the spiritual and intellectual perfection of man. In the Roman world, during the second century, the dalmatic, which was a loose, unbelted tunic with very wide sleeves, came about. It was the outer garment worn over the long white tunic. Interestingly, it was striped and for the most part is the outer garment still worn by Catholic deacons today. By the fourth century, garments worn at liturgical functions had been separated from those of everyday life. Priests could be distinguished by certain ornamentation added to the everyday dress. It was also at this time that the stole began to be used as official symbols of the holy priesthood. The first mention of a special liturgical garment for sacred worship comes from Theodoret of Cyrus (d. c. 457). In his writing on Church history he noted that, in 330, Emperor Constantine presented to the new church in Jerusalem a sacred robe which was to be used by the bishop at baptisms and the Easter Vigil. By the ninth century, the plain vestments of old tended to be more and more elaborately decorated. It was here when pontifical gloves appeared. The miter or the ceremonial headdress most commonly seen on the heads of bishops came about in the 10th century. Liturgical shoes and stockings worn by bishops and cardinals appeared in the 11th century. The priest of today who is vested for Mass is a wonderful witness to these historical roots. 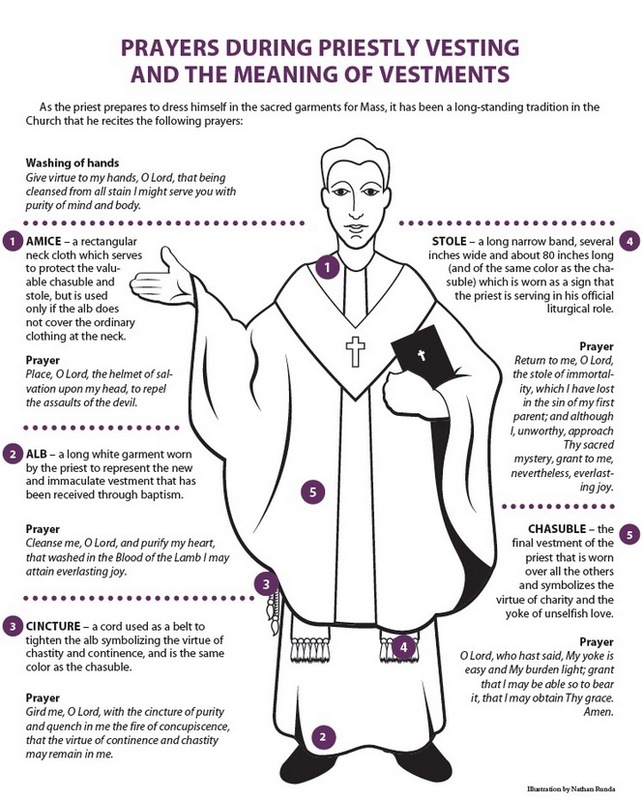 The fact that the sacred vestments were not worn in everyday life from their beginnings shows that they have possessed a liturgical character. Today the draping form of the vestments such as the alb, the dalmatic and the chasuble puts the emphasis on his liturgical role. As such, the priest’s body is “hidden” in a way that takes him away as the center of the liturgical action and recognizes the true source and summit of the celebration, Jesus Christ. The priest thus dons the vestments not in his own name by rather in persona Christi. A priest of the Latin rite today, then, wears the vestments that are prescribed by Church regulations, in keeping with the norms established by the local bishops’ conferences and especially the regulations given by the General Instruction of the Roman Missal, which stipulates that the required vestments are to signify that “in the Church, which is the Body of Christ, not all members have the same function. This diversity of offices is shown outwardly in the celebration of the Eucharist by the diversity of sacred vestments, which must therefore be a sign of the function proper to each minister. Moreover, these same sacred vestments should also contribute to the decoration of the sacred action itself.” (no. 335). The GIRM adds, “It is fitting that the beauty and nobility of each vestment not be sought in an abundance of overlaid ornamentation, but rather in the material used and in the design. Ornamentation on vestments should, moreover, consist of figures, that is, of images or symbols, that denote sacred use, avoiding anything unbecoming to this.” (no. 344). It starts with purple and ends with green, and there is a white and red in between. What do the different colors used by the priest signify? As outlined by the Church, different colors represent different liturgical seasons. Since around the sixth century, the primary liturgical colors have been green, white, purple, red and black. What is the Difference Between a Nun and a Sister? Comments Off on What is the Difference Between a Nun and a Sister? For 99 percent of Catholics out there, there is no difference in their mind between a nun and a sister, nor between an order and a congregation. But in view of the law of the Church — canon law — there are differences, but I will limit myself to only a broad description of the differences. According to canon law, there are Institutes of Consecrated Life and Societies of Apostolic Life today, commonly known as orders or congregations. The main difference between an Institute of Consecrated Life and a Society of Apostolic Life is members of the first must take religious vows, whereas members of a Society of Apostolic Life may take religious vows. While an Institute of Consecrated Life or a Society of Apostolic Life might refer to itself as an order or a congregation, such as the Benedictine order or the Congregation of the Sacred Heart, canon law does not use that terminology. Both nuns and sisters are women religious and constitute a most beautiful way of serving Jesus Christ and all souls in the Church. A nun takes solemn and public perpetual vows of chastity, poverty and obedience (evangelical counsels), and typically spends her life in prayer and work and silence in a cloistered convent. This is the contemplative life. A nun will renounce all ownership of property so she can devote herself entirely to the service of God. A nun also wears a habit. Discalced Carmelites, Poor Clares and Passionists are just a few of these orders. When you think of a nun, think of St. Thérèse of Lisieux, a great saint who spent her life in prayer in the Carmel Convent of Lisieux. A sister takes simple perpetual vows of chastity, poverty and obedience (evangelical counsels), and may or may not live in community, and lives an active life typically serving in health care or educational institutions. Sisters renounce all ownership to property except inheritances and trusts. They may retain ownership of those assets but are not allowed to use the income from those assets. Sisters may or may not wear habits, according to the rules of their community and the spirit of their founder. When you think of a sister, think of St. Elizabeth Ann Seton who founded the Congregation of the Sisters of Charity of St. Joseph and worked tirelessly as the founder of Catholic education in this country. Both fulfill essential tasks in the Church, but the first is focused on the contemplative life of prayer, while the other is dedicated to the active life of work sustained by prayer. Without prayer, no one can persevere in a good work. “The life consecrated through the profession of the evangelical counsels is a stable form of living by which the faithful, following Christ more closely under the action of the Holy Spirit, are totally dedicated to God who is loved most of all, so that, having been dedicated by a new and special title to His honor, to the building up of the Church, and to the salvation of the world, they strive for the perfection of charity in the service of the kingdom of God and, having been made an outstanding sign in the Church, foretell the heavenly glory. “The Christian faithful freely assume this form of living in institutes of consecrated life canonically erected by competent authority of the Church. Through vows or other sacred bonds according to the proper laws of the institutes, they profess the evangelical counsels of chastity, poverty, and obedience and, through the charity to which the counsels lead, are joined in a special way to the Church and its mystery” (Canon 573). They follow the charism and spirit of their founder. Orders can be contemplative or active. The oldest order is that of St. Benedict, but other well-known orders are the Carthusians, Cistercians, Carmelites, Franciscans and Norbertines. Their main task is to pray and adore God in contemplation and offer the prayer of the Church (Divine Liturgy) in community to the glory and honor of God. Men and women members of religious orders wear the habit particular to their order. A religious congregation is also composed of either men or women, but usually in the active life of service to the Church in education, health care or other corporal or spiritual works of mercy. Typically they will wear a habit if they are a sister, but men of religious congregations — if they are priests — typically dress the same as other secular or diocesan priests of the country where they reside. In general terms, religious “orders” — Benedictines (sixth century), Franciscans (12th century), Dominicans (13th century), Carmelites (12th century) — came first, and later came the religious congregations and Societies of Apostolic Life. In all cases, nuns and sisters, orders and congregations, are manifestations of the charisms of the Holy Spirit to enrich the people of God.